If I have a signature appetizer, it is gougères (pronounced goo-zhairs) — an irresistibly light French pastry, made with Gruyère cheese. I’ve made thousands, maybe more. I served them warm at the start of each cooking class, filling my teaching kitchen with the enticing aroma of freshly baked pastry. I’m convinced it was the warm gougères that brought my students back for more. 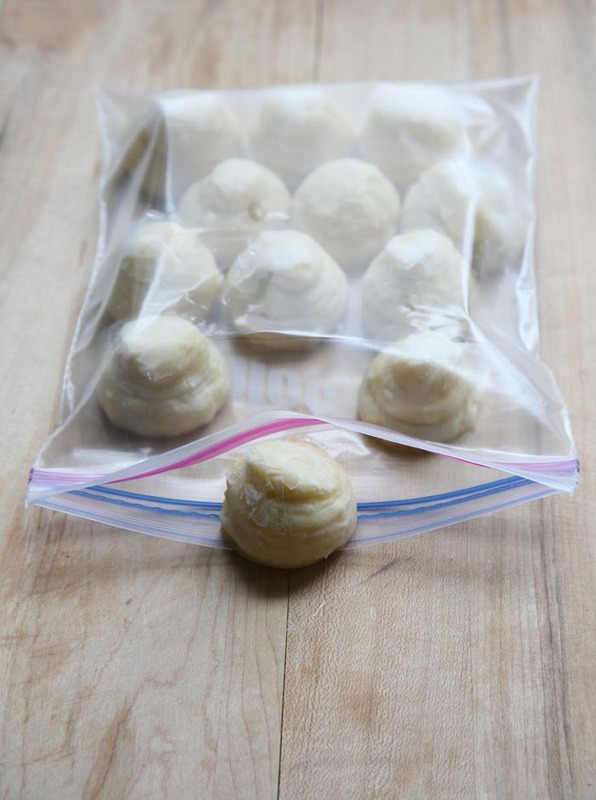 The dough, choux (pronounced shoe) pastry or pate a choux, is easy to master and, best of all, can be frozen and thawed before baking. That means fresh-from-the-oven appetizers anytime. Gougères are scrumptious au natural but they can also be halved to sandwich any filling. I sometimes line the pastry with crisp greens and fill them with hand-peeled shrimp, tossed in a lemony dill mayonnaise. Choux pastry can also be used for sweet profiteroles, eclairs and numerous other desserts. Traditional profiterole recipes omit the Gruyère cheese but I leave the cheese in — it’s subtle and gives the profiteroles a certain je ne sais quoi. To make sweet profiteroles, simply fill the baked and cooled pastries with whipping cream, ice cream or my favourite, pastry cream mousseline (pastry cream “lightened” with whipping cream). You can find a recipe for pastry cream mousseline, by scrolling down my Savarin recipe, where I’ve used it as the cake’s filling. A pastry bag is not essential for preparing gougères but you’ll have nicer shaped gougères if you use one. Alternatively, a small ice cream scoop will help distribute the sticky dough into nice, even shapes. Note: I’ve baked thousands of gougères over the years and discovered that what puffs beautifully in one oven, does not necessarily in another. If your pastries are not light and airy on the first try, you may have to adjust your oven’s temperature to find its sweet spot. They need a good blast of heat at the start. Take heart, these classic pastries have been around long before ovens came equipped with thermometers. Originally published in Eat Magazine’s March/April 2012 issue. Recipe adapted from the choux paste recipe from Le Cordon Bleu Dessert Techniques by Duchene & Jones. In a large saucepan, combine the water, milk, butter, salt and sugar. Bring the mixture to a full boil. Remove from the heat, and add the flour all at once; stir vigorously with a wooden spoon until the mixture forms a ball and pulls away from the sides of the pan. If using an electric mixer, transfer the dough to the mixer fitted with the paddle attachment. (If mixing by hand, use a wooden spoon). Add four eggs to the dough, one at a time, ensuring each egg is absorbed before adding another. The mixture is ready when the dough forms a thick ribbon that is firm enough to be dropped from a spoon (or piped with a pastry bag) onto a baking sheet. If the mixture is too firm, add another egg. Add the grated cheese. Brush the top of each mound with the beaten egg and gently press down with a fork. Set aside for 15 minutes before baking. Bake for 10 minutes then reduce the temperature to 350ºF (175ºC) and bake for another 15–25 minutes, rotating the pans halfway through baking. Test one gougère to ensure it is cooked in the centre. If the mixture is cooked on the outside, but not the inside, turn the oven off and leave the pastries until cooked all the way through. Nice blog! I will be checking back regularly. As always, the photos make me drool…. Thanks for dropping by, Shelly. Let me know when you try the gougères! I am so thankful you took the time to help me get this recipe right! I make them all the time, not only for my dinner guests, but my mom’s as well!! The only downfall is that my mom says I owe her them for life! I’m so pleased choux pastry is part of your repertoire, Stacy. Stay tuned for pommes Dauphine — choux pastry mixed with mashed potatoes and deep-fried. Yes, deep-fried. You have to try them, at least once. Your mom will be so impressed! Denise, my friend and I had such success that we are going to dedicate an afternoon to making and freezing gougeres with different variations! Am going to try the warm olives and goat cheese next week… Cheers! An afternoon dedicated to choux pastry? That’s my idea of fun, Diane. I’d love to hear about your savoury variations. Oh, don’t forget to set aside a few for sweet profiteroles. You haven’t truly lived until you’ve tried one stuffed with pastry cream, “lightened” with whipping cream, and dipped in caramel. You crack me up, Diane. Making a kazillion gougeres sounds like a party in itself. You’ll find a recipe for pastry cream “mousseline” in the recipe for Savarin Cake. I used it to fill the cake. Mousseline means “lightened with cream”, a phrase only the French can get away with. The whipping cream does, in fact, make the pastry cream lighter and much more appetizing. You two are blessed with creative palates; can’t wait to hear what you eventually decide. Good luck! Our best success was with the savory gougeres was using finely chopped pickled jalapeno peppers. They are so good! We are going to experiment with red pepper, chives, and perhaps some Mediterranean flavours. Anything with pickled peppers has got to be good — never added them to gougeres — I’m going to give them a try. Your flavour combinations sounds very creative, Diane. It’s hard to say why some pastries puffed and others did not. I wonder if your oven was hot enough. In my commercial oven, I bake them at 360 and they puff beautifully. In my current oven, I need to preheat the oven to 425, bake them for about 10-15 minutes then reduce the heat to 350 — otherwise they don’t rise. Resting the gougers 15 minutes before baking seems to help, too. Good luck with the next round. By now, you’re a pro! 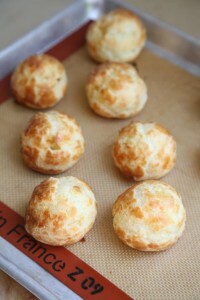 I am planning on making cheddar/jalapeno gougeres for Friday evening. What is the best way to make the dough on Thursday and have them fresh baked for Friday? Also, can I use fresh jalapeno instead of pickled and can I substitute a combination of 1/2 & 1/2 and 1% milk for the whole milk? Cheers….you are still greatly missed in Victoria. Cathie, I’m so pleased you’re making gougeres! You have a couple options for making gougeres ahead of time. You can prepare and refrigerate the dough on Thursday, then shape and bake them on Friday. Just be sure to bring the dough to room temperature before you shape them (otherwise the dough is too stiff to work wiht). Alternatively, you can prepare, shape, and freeze the (shaped) dough on Thursday, then thaw and bake on Friday. Yes, you can certainly use fresh jalapeno peppers — just be sure to chop them finely. Re the milk substitution, I don’t see why your combination wouldn’t work. I often use 2%, instead of whole milk. One more thing – be sure to have your oven good and hot before you bake the gougeres. They don’t rise well without that initial blast of heat. Oh no! How disappointing. It’s difficult to know exactly what went wrong but I’m guessing it’s a temperature issue. Perhaps try keeping your oven hot — and reduce the temperate to 400 degrees (rather than 350 degrees). I’m sorry this didn’t work out this time.